You know Shake Shack. You love Shake Shack. There are many reasons why — they’re friendly, they use meat free of added hormones or antibiotics, the crinkle fries are flawless — but perhaps the biggest reason is also the simplest: The signature Shack Burgers are some of the best hamburgers in existence. In many ways, the burgers — griddled patties, lettuce, tomato, Shack Sauce, those perfectly squishy Martin’s potato rolls — brought a newfound level of respect to fast-food burgers. 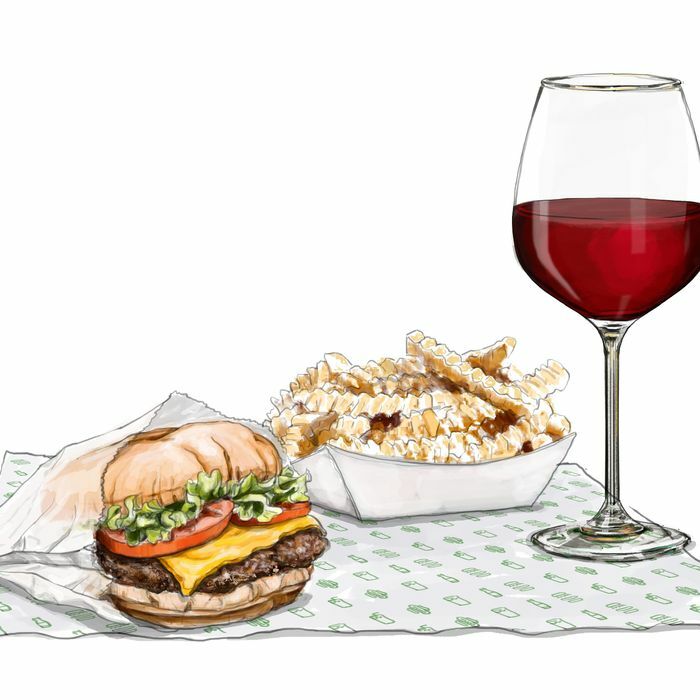 So it only makes sense that the ideal wine to drink with a Shack Burger is similarly in need of some image rehab: Australian Shiraz. Here’s why it works: Shiraz is the Australian equivalent of French Syrah. It’s the same grape, pronounced (and spelled) differently. Australia’s warmer climate makes a wine that is magical and peppery with big, dense tannins — perfect with those charred beef patties. The tannins tame the beef’s heaviness, and even that sweet Martin’s roll plays quite nicely with Australian Shiraz’s ripe fruit and subtle earthy notes. I’m going to suggest a few high-end bottles here, so you can see for yourself what I mean. The interwoven tale of how Scotland played a role in the creation of the modern Australian wine industry is an interesting one. Giles Cooke and Fergal Tynan, both Masters of Wine, continue that tradition with their small-batch, minimal intervention, and delicious bottlings. A young but well-known winery focused on telling the story of how diverse the terroirs of South Australia can be. This bottling comes from Barossa Valley, which is a supercool place because it’s home to some of the oldest vineyards still living in the world today. This is, in my opinion, the ultimate Down Under splurge. From the same house that produces the incredibly famous Grange, this is a pure and beautiful expression of classic Shiraz at a fraction of the price of its big brother (often north of $500 for current vintage. For older vintages, the price goes much higher).